Once you have added a record of teaching service, you are given the option of entering any supporter meetings and/or records of observed teaching sessions that have taken place during the period. To add to either of these records, simply select the 'view' option form the 'Tools' column under the main record of teaching service screen. If your period of teaching service lasts for more than 20 days in any school, you must record at least one record of observed teaching session and get this signed off by your supporter or head teacher. 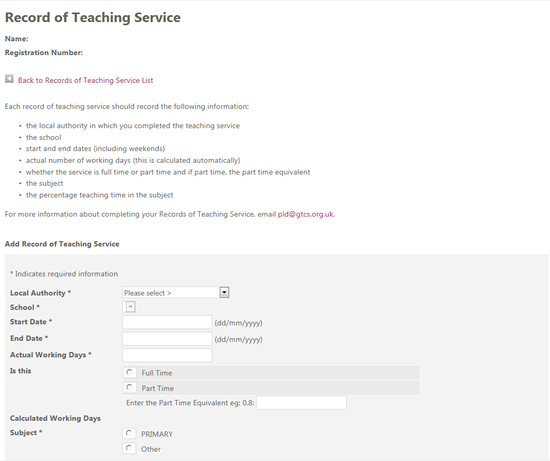 The option to 'submit for sign off' will appear in the 'Tools' column of the main record of teaching service screen.